laiyaraaja is the first composer to win a National Film Award in the newly instituted ‘Best Background Score’ category. The Award was given, not just because Ilaiyaraaja's score for the Malayalam film “Keralavarma Pazhassi Raaja” was the best of that year, but also because, in 35 year long career as a film score composer, every year, one of his films' score was always the best of the year. The book “Moods of Ilaiyaraaja” is a brief introduction, I repeat, just a “brief Introdution” to the genius of the film score composer Ilaiyaraaja. 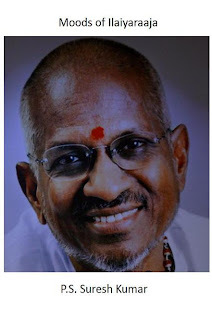 With an extensive analysis of background scores of few of Ilaiyaraaja’s films, the book elaborates why Ilaiyaraaja is and ever will be the best film background score composer in India. The book also traces the evolution and background of film scores in Indian films, in general. Awesome, I am going to get this book at once. Can you tell me if there is a technical difference between what we call re-recording, background score and a soundtrack? If they are just the same, how did the different terms come about? If they are different, what is the difference? Suresh, Congratulations!! You are doing a great job. Will buy the book asap, can' wait to read. All the terms are colloquially used for background score. Re-recording is the technical process of adding sound to the film. Soundtrack also includes both the songs and the score. Score is just the background score. Looking forward to read your book. Also i wish it comes in as published print. Congrats on the book, Suresh.. ! Hope you continue this journey into composing your own music as well. Really good initiation from you. Congratulations!! I have been following your blog and it is really very much interesting. Just my opinion.. Ideally no artist gets national award for a year also because of his amazing past works. Though that may influence the award committee, I personally feel it is nt political for you to make that comment about why Ilayaraja received the national award. I read you book. The associated verb with music that rings out better for me is 'playing'. 'Putting' music, somehow, rankles. Nobody, henceforth, can claim that none produced a book on Ilayaraja's creative output, at least. Glad you turned in one. If i may suggest, a mixed media output - video, audio and either a text or voice commentary would appear less tedious than in a 'book' format, i thought. Still, you worked a thought to produce a book. Kudos to that. G - Thank you for your honest opinion on the book. Yes, it is difficult to read the book, if the reader has not seen the film, the background score of which is elaborated. Honesty is a different game altogether. Honestly, for a man who hints at being in the know-how of stories of producers asking specifically for Salil Chaudary and generally the Indian music scene - I'd have expected an evolution of orchestrations or something of the sorts. There was the colorful and efficient goan bunch, the calcuttan bunch and the bombay gang. Wasn't a goan doing the arranging for MSV's famous big band? Things like that. For a man who hints at being able to interview matt dunkley, i'd have expected - at least, in terms of technology and the work standards, if not musical outputs - where we stand and what has traditionally been the difference. For an author who's output borders musical arrangements and orchestrations, especially from a country who's tradition doesn't emphasize as much on harmony as it does on unison, i'd have expected much on the topic of how the concept of a 'good sound' would vary across geographies. Considering all this, this particular book appears perhaps a tad premature. Your personal observation skill or potential appears capable of tackling a 'book' with more meat. I'm sure you know it best anyways. Like i said, Honesty is a different game. G - Loved every bit of your comment on the book. Your expectations are valid. Points taken. THAT is your honest feedback. Cool. I had a hunch you'd read the comment right. Seriously, who arranged and who was/were the sound engineers for raja-sir? I've heard stories about his stock violinist (narasimhan?) & guitarist (sada-sir of "ilaya nila" fame). But not much about his crew - which in their bad days even let coughs in the studio and metronome ticks into the master recording (!!!!). Some of those recordings are atrocious. A good musical ear will dig out the buried musicality and appreciate raja-sir anyways. When H sridhar ran Rahman's shop - that was the biggest difference - he laid it out in the open and rahman thankfully was more particular of sound quality than Raja-sir. Anyways, love your work. Looking forward to more stories either as a blog entry or a thought-driven book, which researches along the way and perhaps not only documents existing info and opinions. G - That "Making of Music in Ilaiyaraaja's Studio" itself is a great topic for a book, which can be put togather from Conversations with Ilaiyaraaja's sound Engineers, conductors and instrumentalists. Such a book will happen, someone will write it and it is only a matter of time. G - a lot of honest opinions. I differ, though, in comparing the sound quality of various time zones. It is like saying why Ben Hur did not have the sound effect of Titanic. However, let me repeat, lest I'm misunderstood, honest and knowledgeable feedbacks on music related stuff are rare and hence thanks again, on behalf of all music lovers. Suresh - great effort. Would love you to do more analysis on the way Raaja has done music on various genres - Apoorva Sahodarargal (well made mainstream commercial movie), Michael Madana Kama Rajan (comedy which can take a classic status), Muthal Mariyadhai (rural realistic movie), Siva (masala adventure), Nizhalgal (urban realistic movie), Moodupani / Sigappu Rojakkal (psychic thriller), Avatharam / Sindhu Bhairavi / Punnagai Mannan / Koil Pura (film in specific music backgrounds), etc. Pl. note - the movie names given above are just samples and there may be better examples in each genre. Do keep up the good work. V - Thank you for your comments on the book. Yes, an ideal book on Ilaiyaraaja's scores would be the one that delves deep into the 'Versatility' aspect of Ilaiyaraaja's genuis.